If you've checked your Windows Phone 7.5 device for the 7.8 update with no success, you may want to try to force the process, just as we did with other Windows Phone updates like Mango. This is a little different than downloading and installing Windows Phone 7.8 manually, which we reported on earlier. With this method you're basically tricking the Microsoft servers to recognize your Windows Phone and initiating the update early. Think of it as cutting in line (and Microsoft is okay with this, no worries). The other benefit with this method (versus the CAB one) is it means you are getting the official carrier/OEM update that usually includes the firmware too. If using just CABs you are updating the OS but not any device specific software. That's not a bad thing but it's really not ideal. Forcing requires patience and the ability to disconnect your computer from the internet. Make sure you have the Wifi and your data connection turned off on your Windows Phone and connect to Zune. Go to settings and check for an update and as soon as you click the "Update" link in the settings you'll need to disconnect from the internet. Let Zune come back and tell you that it can't check for an update right now, reconnect to the internet and you should see that an update is now available. Timing seems to be key and it may take you a few tries to get things just right (took me six tries). 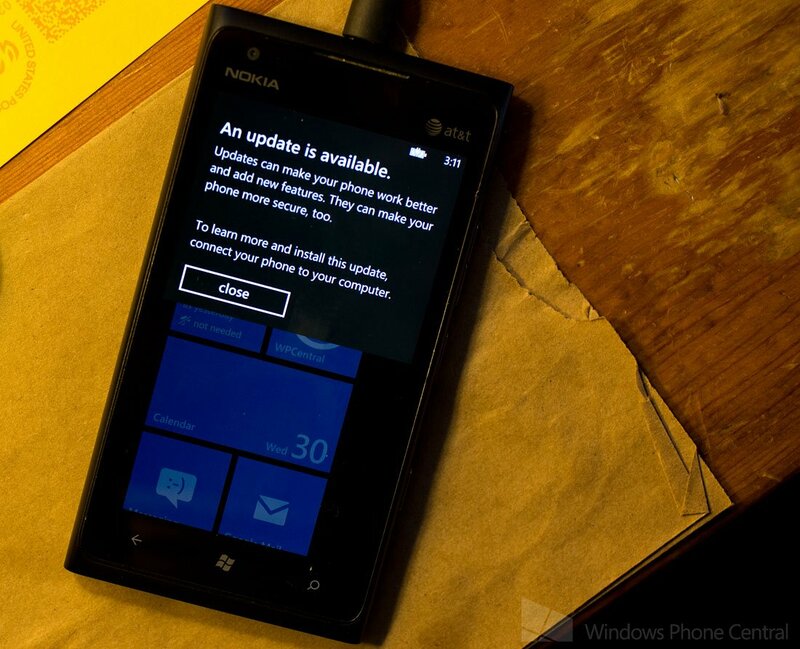 From there you follow along with the update wizard and your Windows Phone is updated. If this trick doesn't work, it likely means that the update files for your device aren't out there on the servers yet to be installed. We were successful in forcing the update on the AT&T Nokia Lumia 900 but couldn't get the HTC HD7S to update. When all was said and done, the Windows Phone version ended up being 7.10.8858.136. Interesting note on the 7.8 update is that it provides support for devices without a camera button. More than likely this is for future low-end devices like the Alcatel One Touch where the lack of a camera button will keep production costs down. You may see this in a smaller update that installs before the 7.8 update goes through. Wait 30 seconds or so and Zune should display a notification that an update is available. Celebrate! The whole process, including backup could take up to 60 minutes. Check that you are on build 8858 to see if you are done. What if this method just doesn't work? 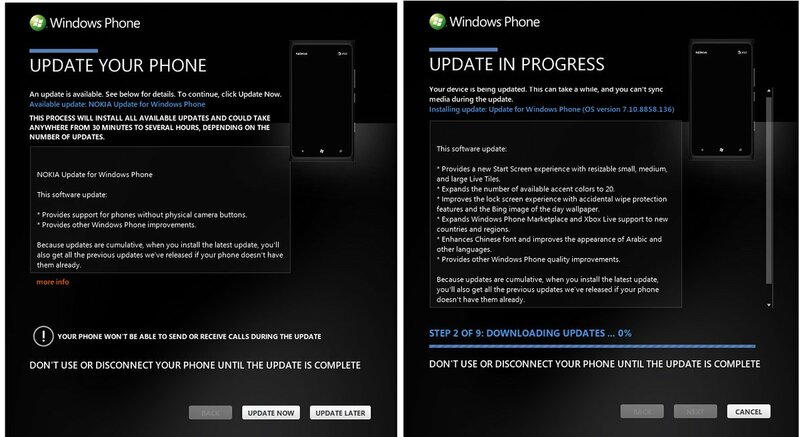 This won't work for every Windows Phone out there, only those that are officially designated for the 7.8 update, so your experience will vary. If you don't get the update, it can mean one of two things. Your software update is literally not on Microsoft's servers for your phone/carrier. Try again in a few days. Your update may never come. On the second point, we're not too confident generation one devices or Sprint's Arrive will ever "officially" get this update, which is why try as they might this method will never work. For you folks, you'll have to do the more tricky manual CAB method.That will do the job but obviously it won't include any firmware. C'est la vie. Let us know in the comments if you've had success with the forcing trick to get the update.